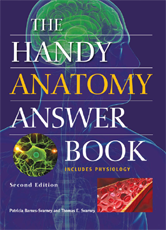 The Handy Anatomy Answer Book is the key to unlocking this door to a wondrous world. Covering all the major body systemsintegumentary (skin, hair, etc. ), skeletal, muscular, nervous, sensory, endocrine, cardiovascular, lymphatic, respiratory, digestive, urinary, and reproductiveand, for good measure, adding chapters on growth and development and how science can help and augment the body, it follows the fascinating maze of organ systems and shows how much the body does routinely just to let you move, breathe, eat, and fight off disease.